I love to hunt with twenty gauge autoloaders and have done just that for fifty years. Here, we are going to look at two affordable models with familiar nameplates: Mossberg and Weatherby. The Mossberg SA-20 is tested in the walnut / blue trim, with a street price of just under $500. While the Mossberg is gas-operated, it goes up against the recoil-operated (inertia) Weatherby Element Waterfowler (camo) model that runs about $650 street price. 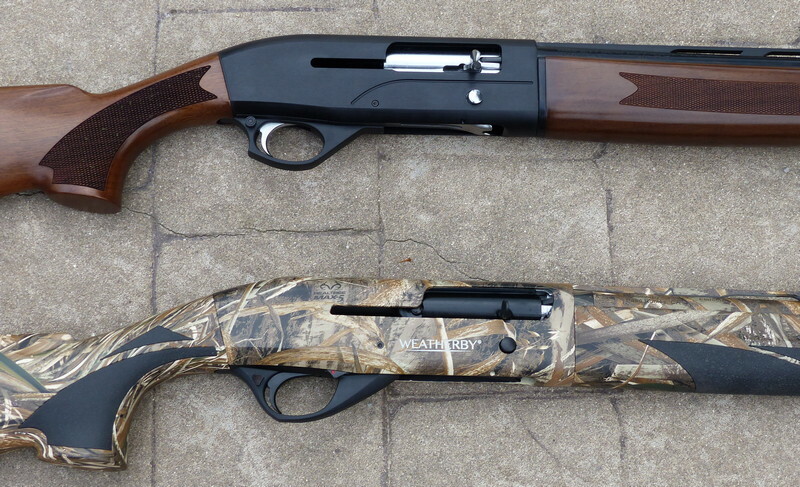 Both are made in Turkey: the Mossberg by Armsan, the Weatherby by ATA. Both are 3 inch chambered twenty gauge autoloaders tested with 26 inch barrels. The Mossberg SA-20 weighs 6-1/4 lbs. and has a 6-3/4 lb. trigger. Though Weatherby claims on their website that this model weighs 6-1/4 lbs., it is over a quarter pound heavier at 6 lbs., 9 oz. and has a 6-1/2 lb. plus trigger. The Mossberg SA-20 comes extremely well-presented in a foam-lined hard case, with gun sock type sleeves inside for both the barrel and the action / buttstock as well. The Weatherby comes in a cardboard box. The Mossberg has five Mobil-choke style choke tubes. The Weatherby comes with three standard Invector style tubes. The Mossberg has a brass front bead; the Weatherby has a green tubular bead. Both the Mossberg SA-20 and the Weatherby Element are offered in cheaper black plastic stocked models. The Element comes in walnut as well, actually a high grade walnut stock only, that retails for $1099 with a street price of approximately $820. Weatherby has no written warranty but promises to stand behind their products. Mossberg has a one year written warranty on the SA-20. Both the Mossberg SA-20 and the Weatherby Element are easy to load. While perhaps unremarkable in the case of the Mossberg, many 20 gauge inertia guns are real thumb-busters as is the case with the previously reviewed Benelli M2 and the Franchi Affinity models. The Weatherby Element does not have this obnoxious problem. The Mossberg has a thin, soft durometer pad with a hard heel insert. While the Weatherby has a bit thicker pad, it is curved making aftermarket replacement problematic. Both shotguns have small safeties, however the triangular Weatherby safety is truly dinky. The trigger guards on both shotguns are plastic. The Mossberg SA-20 manual oddly states, “This 20 gauge semi-automatic shotgun is chambered for 3 inch magnum shells. It is designed to be used with factory loaded shot shells between 2 3/4" (15/16 oz.) and 3" (1 /1/4 oz).” The standard 20 gauge target load is 7/8 oz., not 15/16 oz. Weatherby says nothing specific, only that the 12 and 20 gauge models are capable of feeding and firing both target and hunting loads up to 3 inch. Armsan and ATA are two of the better Turkish makes out there as far as autoloaders. Weatherby uses primarily ATA, but also uses Armsan in their SA-08 28 gauge. Mossberg uses Armsan in this SA-20. Both shotguns are well-balanced and fit similarly; both fit me well just as supplied. The Weatherby Element has a bit longer overall length, to be expected with a conventional inertia gun that typically has a longer receiver than gas guns. Weatherby has done a very good job with the grip panels that they call “Griptonite,” just as on the previously tested Element in 12 gauge. My expectations for a good hunting 20 gauge are pretty basic. I expect a modern 20 gauge autoloader to function with 7/8 oz. 1200 fps loads for some clay target fun and also, to function flawlessly with 1-1/4 oz. pheasant loads without breaking itself or my shoulder. In part two, we will see what happens.